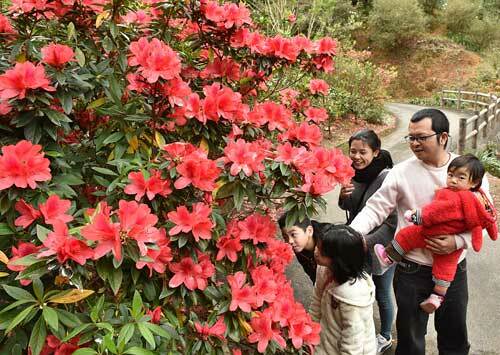 Visitors to the park enjoyed watching bright red Azalea flowers at the Higashi Sonmin no Mori Tsutsuji Park on March 1. The 33rd Higashi Village Azalea Festival has kicked off at the Higashi Sonmin no Mori Tsutsuji Park on March 1. Although the flowers have been slower to bloom than in previous years, with the most of the plants in the park only partly flowering, some were blooming in bright red and pink colors. The best time to view the flower is in the middle of this month, according to park staff. Visitors searched for blooming flowers, and enjoyed the coming of spring. The festival will be on until the 22nd of this month, and visitors can observe the flowers　until the 29th. The entrance fee is 300 yen for high school students and adults. There are also stage events and other activities planned for weekends during the festival period.